People who work or study at Grand Canyon University probably know about such high-profile student groups as Havocs with Heart, the Speech and Debate team, and Educators Rising. 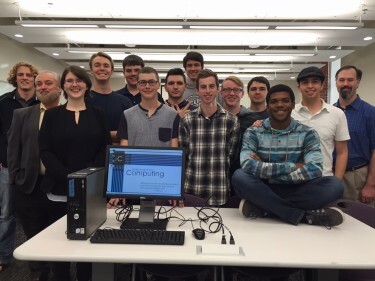 But tinkering just out of sight is another association of altruists: the Innovative Computing (iC) Club, composed of techies with tender hearts dedicated to putting their know-how to good use. Members of GCU’s Innovative Computing Club and their advisers display one of 100 computers they retrofitted and are deploying to charities. About two dozen club members have toiled tirelessly after school for the last year to refurbish, reprogram and redeploy 100 donated computers. This month, they began sending the fully equipped desktops — complete with monitors, keyboards and mice — to four Arizona organizations that help disadvantaged community members. Three recipients are in the Phoenix area: the American Indian College, North Mountain Community Assembly and the Maricopa County Sheriff’s Office community relations program, which supports mentoring and tutoring of disadvantaged youth. The fourth, Higher Ground, is a Christian-based community resource center in Tucson and exemplifies the long reach of GCU’s community involvement, said Dr. Steve Powelson, College of Science, Engineering and Technology IT faculty member. “GCU should be branded throughout our state as the University that cares by providing an opportunity for positive generational change offering a Christ-centered, relevant education,” he said. iC club members are as eager to apply and share what they have learned as they are to attain the knowledge, Powelson said. 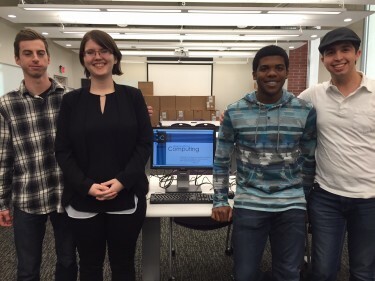 From left, club officers Ben Schinn, treasurer, Bridgette Smith, secretary, LaMarr Pace, vice president, and Paul Rodriguez, president, stand next to a reburbished computer. The club’s many co-curricular activities have included refurbishing an old-fashioned arcade game into a new gaming device and building a small, pet-like robot named Gubbins, Powelson said. Poweslon is the club’s co-adviser along with fellow CSET professor Luke Kanuchok, who was instrumental in the club’s formation. Students chose their compassion mission almost as soon as they formed the club in the fall of 2014, said LaMarr Pace, club vice president and project organizer. It took more than a year — and some magic from professors — to make it happen, Pace said. 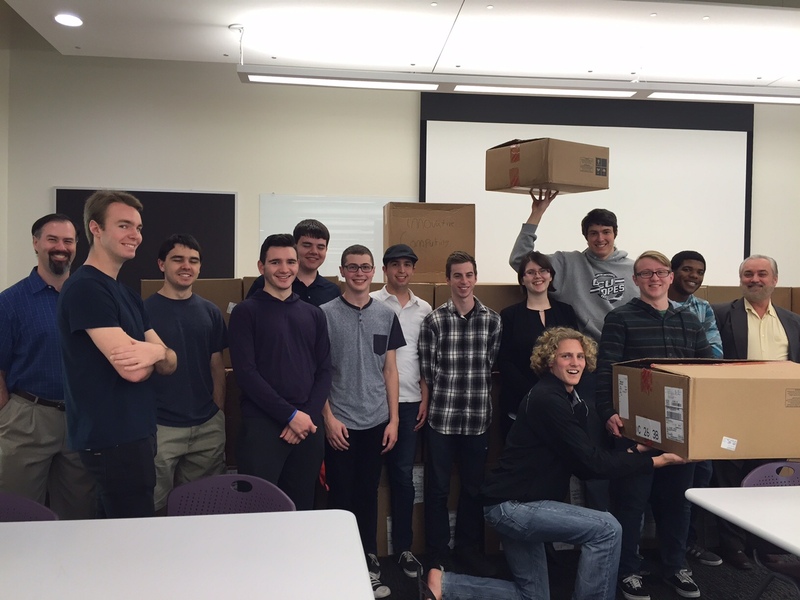 The first step, the donation of 100 OptiPlex computers from GCU, was facilitated by CSET Associate Dean Dr. Michael Sheller. “Dr. Sheller pulled some strings and knew who to call for what,” Rodriguez said. 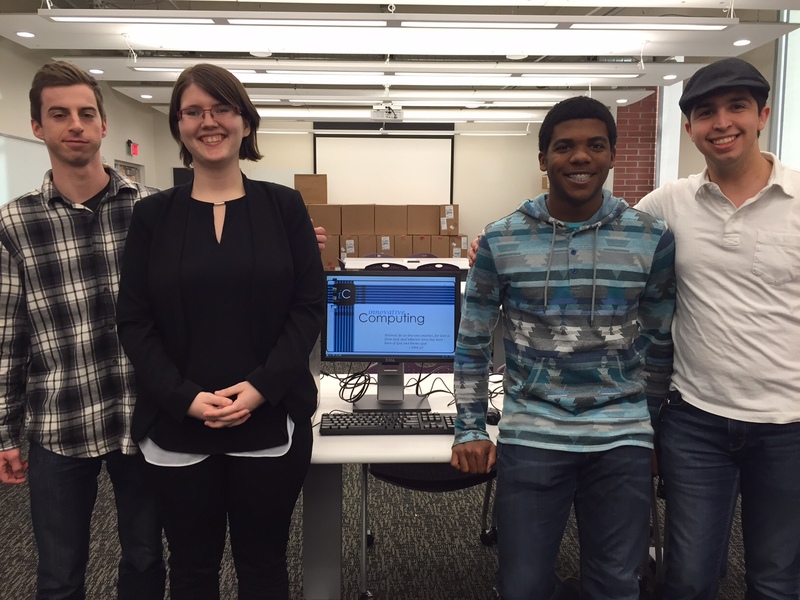 The students wanted to donate complete desktops, install an inexpensive yet effective operating system, and include the capacity to remotely communicate with the users. After extensive research, they chose Linux Mint, an open-source system that is close to what the industry is using, Pace said. Powelson helped the club clear another hurdle when he procured 100 monitors, keyboards and mice from IBM. “He’s like our Gandalf. He comes when needed,” Rodriguez said. Powelson, an entrepreneur who has operated his own technology and equity finance businesses for more than 25 years, said the credit is misplaced. Club members posing next to the computers they are giving to four Arizona organizations. “I think God had something to do with it,” he said of the IBM donation.